Quite the end-with-a-bang game for the Sharks as they wrap up 2009 with a 3-2 shootout victory over the Phoenix Coyotes. 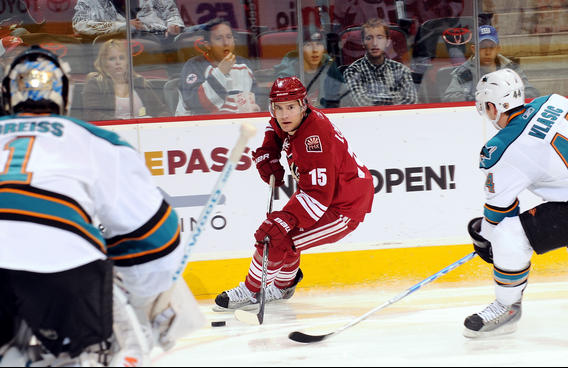 The win snapped Phoenix’s 10-game home win streak and increased San Jose’s win streak to seven. It also marked the third time these two teams have gone to shootouts out of four meetings. Phoenix is like that annoying sibling you have; you keep closing your door, but they keep opening it, peeking in and asking what you’re doing. As much as people want to believe the Coyotes are a playoff team, they’re not. They will fizzle out as the season nears the end. But they did dominate the first period, outshooting the Sharks 18-4. Thomas Greiss got the call to spell Evgeni Nabokov, and “Jesus Greiss” was spectacular. He is the reason the Sharks came out with two points. Kent Huskins and Dan Boyle were the goal-scorers. Huskins scored on a seemingly harmless shot from the point, but Phoenix defenders screened the perennial thorn-in-the-side Ilya Bryzgalov. Boyle scored in the second period, and that goal was the 100th of his career. Congratulations to Boyle. The big guys were quiet tonight. Joe Thornton didn’t score a point, which ends his 17-game road point-scoring streak. One thing I’d like to address again is penalties. The Sharks scored first, followed by two Phoenix goals. After the Coyotes second goal, the Sharks took three penalties. They’ve done this to themselves more than they should lately, and the penalty kill managed to bail them out. I don’t know if it’s pressure or laziness, but if there’s any time not to take penalties, it’s after an opponent scores. Hopefully, this gets addressed. Also, throughout the overtime period, the Sharks seemed content to go to a shootout. Nobody pressed forward; defensemen skated around in their own zone and didn’t pass. Now this has been an all-year thing. They seem more afraid of making a mistake than making the other team make them. In the shootout, Greiss stopped everything in his first NHL shootout. It reminded me of Nolan Schaefer a few years back against Calgary, in the first year of shootouts. Ryane Clowe used his infamous backhand move to beat Bryzgalov and send the Sharks into 2010 on a high note. Before the shootout, the zamboni scrapes the ice in the middle. This time, the zamboni didn’t do a very good job on one side, which put the Sharks players up in arms. Was it intentional? We’ll never know, but it certainly makes you wonder how many teams subtly try to get advantages through the ice crews. Even though Joe Pavelski missed his shootout opportunity, he is still 16-30 (53.3%) in shootouts. The Sharks are no 16-1-3. They haven’t allowed a first-period goal in eight straight games. Hit-O-Meter: SJ 21 PHX 21; Clowe led the team with five. The Sharks welcome the Oilers to town on Saturday.